Here’s an article from this week’s Broadcast. Embarrassing Bodies: Kids starts tonight at 9pm on Channel 4. Channel 4 has unveiled yet another brand extension for the Embarrassing Bodies franchise: a website devoted to children’s health. The site, to be hosted at channel4.com/kids, will feature exclusive videos and applications featuring the doctors from the main show and the four-part Embarrassing Bodies: Kids, which begins this week. Parents will receive reminders as children hit further milestones and when they require immunisations and health checks. A Kids Lifestyle Checker application analyses a child’s lifestyle and calculates risk levels for 13 key conditions, and offers personalised advice on making positive changes. 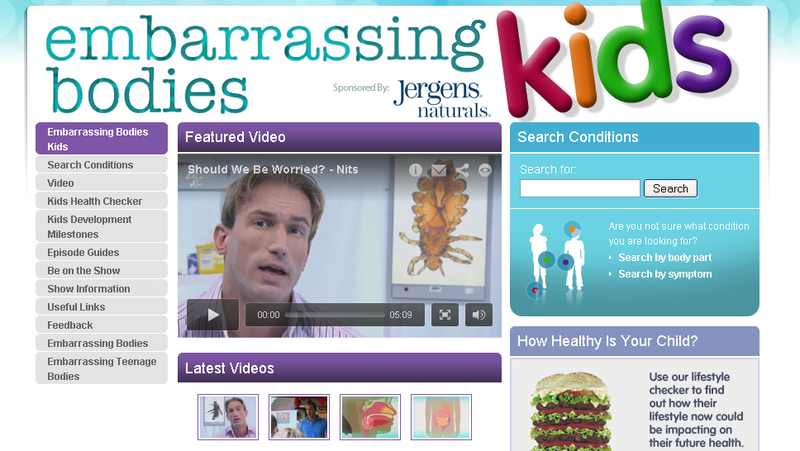 Dr Christian Jessen is fronting a series of videos billed as Should We Be Worried?, in which he explains the symptoms and remedies for more than 80 of the most common childhood illnesses. The site will span health issues affecting children of all ages – from babies and toddlers to older kids – and will be integrated with government-funded health advice site NHS Choices. C4 cross-platform commissioner Adam Gee said the site was launched to address the lack of high-quality video on the web tackling children’s health issues, with older kids particularly under-served. Embarrassing Bodies’ established website, at channel4.com/ bodies, has been used by 6 million people to date and has attracted more than 6.5 million video views. project Science of Scams; and Who Killed Summer?, a web teen drama produced by Bigballs Films, MWorks and Hideous Productions. The children’s website will go live next week, and on 14 May the established live web show Embarrassing Bodies Live will focus on children’s health. Last month, Maverick unveiled a 4 x 60-minute extension to the brand, Embarrassing Fat Bodies, and won an 18-part recommission of the main show. Last year, it produced a special edition centred on old people.